What if the world we knew had ended? Would you try your best to salvage all remains of it and find a way to rebuild it again? And if you planned to, does that mean you have to set aside all your empathy? How far would you be willing to go for the greater good? And is the greater good really what you think it to be? Those are the questions that a dystopian should focus on. Not halfheartingly falling in love with two guys. Some dystopians that I’ve read don’t feel enough like it truly is the end for all humanity. Most of the time it’s the end of a democracy, or a social commentary on the way we use technology. 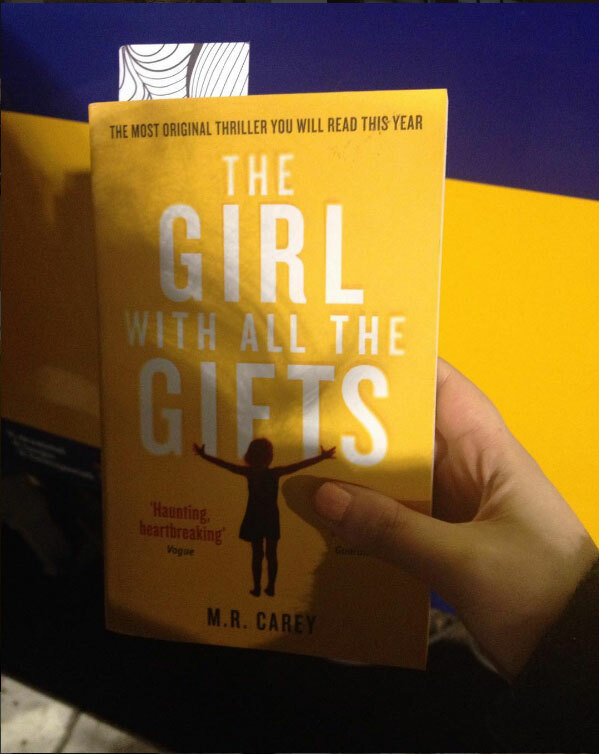 Not The Girl with All the Gifts. This novel begins with a tale not unlike Never Let Me Go. It plays with ethics and how we would handle humans that aren’t all that human in someone’s mind. Even though the ones that treat them may have less human qualities. I imagined it to stay in this setting. I would have been happy with just that. The Girl with All the Gifts is written masterfully. The way things Melanie describes with all the knowledge she has (and more importantly NOT with things she can’t know being as sheltered off as she is) is done really well. All the points of view in this book are without a doubt there own. You don’t need names on the page to know who’s pov you’re reading. It’s all apparant from the way they see the world. This novel is constructed extremely well. From the narratives to the worldbuilding. There’s no doubt that this is a dystopian Britain. I mean, they mention David Attenborough! I wasn’t surprised when I learned M.R Carey worked on the screenplay for this at the same time. Every seen is easy to imagine. You feel that the writer didn’t just have the words in his mind, he could easily conjure a picture of everything that happened. This makes it easy for the reader to do so. I wonder if this is because the writer is a comicbookwriter. Due to this fact the world really feels like it has already ended. Everything the characters knew or got accustomed to will perish. It takes a lot of skill to make that believable. So does the pacing. I should have given this book 5 stars. In terms of it being a masterwork, it deserves it. I doubt I will read a dystopian in a long time that really manages to convey the world being so destroyed. The idea behind it is very believable and just really super cool. But instead I gave 4 stars. Why? There were times when they were on the go that I couldn’t bring myself to care. They came across too much of the same. Always looking for answers to questions I had lost interest in. And the weird thing is, I know that’s not because of the skill level of the writer. I think it’s more because I might have not been in the mood to read this at that time. However I think books that I give the highest rating should be able to make me fall head over heels no matter what genre I crave to read at the time.